In the fast growing market of biopellet media and the associated media reactors, it comes to no surprise that the crew at CAD Lights is getting on board the trend. But in true CAD Lights style, they aren’t quite falling in line with that trend when it comes to the design of their latest product, the Conic Bio-Reactor. Tossing the standard media reactor design out the window, this new biopellet tumbler uses an inverted cone shape instead of the old cylindrical design. Taking it all a little further, the feed pump has been situated directly under the reactor, which obviously saves a ton of space in the already overcrowed sumps and refugia of aquarium keepers, as well as elminates the need for additional tubing from feed pumps. So why the radial design? A video below demonstrates just how effective this inverted cone-shaped reactor is at tumbling the biopellets. As can be seen in the clip above, the cone shape allows the pellets to not only tumble, but the entire mass of pellets spins and gyrates rhythmically from top to bottom. 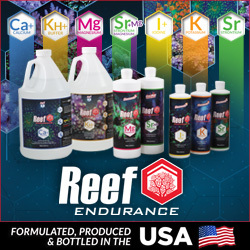 This eliminates any possibility of dead spots in the media, which have been a major drawback to solid carbon dosing, causing most aquarium keepers to look the other way. 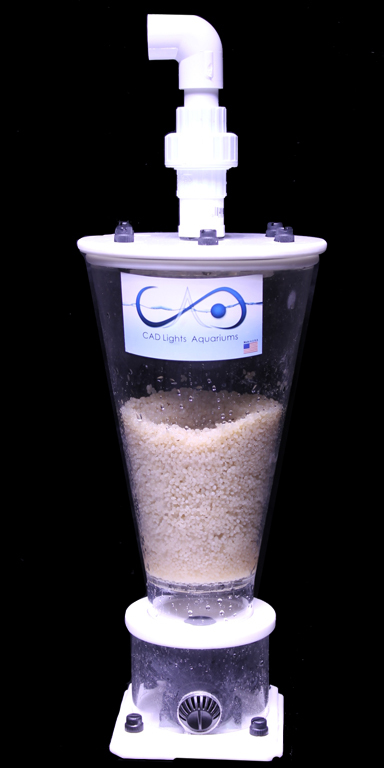 This new CAD Lights Conic Bio-Reactor is rated for aquariums up to 150-gallons and has a very reasonable footprint of 6″x6″. The retail price for the cone-shaped reactor is set at $175, which includes the reactor body, the pump, and all associated plumbing pieces.